Leaving Damn Yankees on the 11.5 mile adventure. 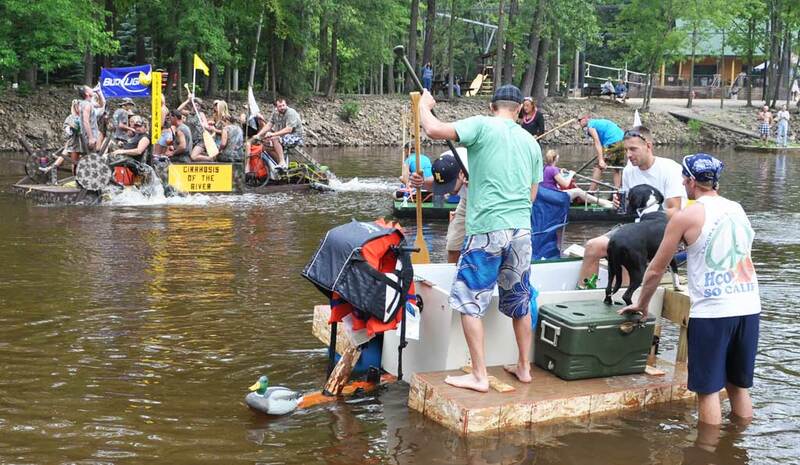 The Wolf River Raft Race promotes a safe, fun, family-oriented event. Participants are encouraged to act responsibly, show good sportsmanship, assist other participants if necessary, show respect for the river and the land-owners along the river, and of course, have fun! Captains are responsible for knowing the race rules and ensuring that their crew follows them for their own safety, the safety of other participants, and to ensure that we will be able to hold this event in the future. Keep in mind that there will likely be boat traffic on the river during the race, as well as DNR and/or Sheriff Patrol boats. Race day announcements take precedent over these rules! Changes will only be made if river conditions dictate, or at the suggestion or order of law enforcement. If any changes need to be made, they will be announced at the mandatory crew meeting and/or registration/inspection. There will be a mandatory meeting at the landing 15 minutes before the scheduled start of each race in case there are any changes or last minute announcements that need to be made, with the race starting immediately after. Race course will be down the Wolf River to The Waters Supper Club and Lounge, New London, WI. Distance for the canoes and kayaks is approximately 11.5 miles from the Damn Yankees starting point at Buchman Access. The homebuilt and commercial course is about 4.5 miles from the start at Volz's Landing. Race duration can vary widely dependent upon river level, raft design, and "competitiveness" of crews. Average raft speeds vary greatly depending on raft design and crew, but most rafts will average between 1 and 2 mph with less experienced rafters usually being in the lower half of the average. ONLY ONE RAFT AVERAGED FASTER THAN 2 MPH IN THE 2011 RACE! Canoes and kayaks averaged 2 -3 mph in 2011. Individual crew members should consider the anticipated length of time on the river when determining if they are fit enough to participate. Rafts found to be floundering mid-race or in danger of failure to finish before dark will be required to accept a tow. Rafts can be constructed using any materials other than commercially available hulls or pontoons. Rafts should be constructed using a sturdy main frame with flotation and any decking, seats, and accessories/equipment securely attached to the main frame. Rafts can be propelled by any means that uses human-power. Any kind of oars, paddles, poles, etcetera, are allowed. (Paddles do NOT have to be home-made, but they can be) Also, any mechanical means of propulsion is allowed such as paddle-wheels or propellers powered using bicycle gear or anything else racers can think of, as long as it’s powered by the crew. Sails will also be allowed if someone thinks they can make it work. Rafts should be designed so they are easy to exit regardless of their orientation in the water. When designing your raft, consider how the crew would escape if it were to capsize! *A US Coast Guard approved personal flotation device in possession of each member of the crew which should be worn at all times. *A container for garbage (bag/can/box) secured to the raft. Recycling is also encouraged. There will be garbage and recycling bins at the finish line. *A 3/8" (or larger) tow line at least 25’ long securely attached to the main frame of the raft for towing or mooring. *Flag Holder for a flag on a ¼”-3/8” pole – Anything can be used including a piece of pipe, a vise-grip, duct tape, a hole drilled in part of your raft, etc…Just so the flag can be displayed. *Basic tools such as hammer, pry bar, Leatherman-type tool, etc. *Shoes/dock shoes/sandals –Shoes will be required at Damn Yankees and The Waters at the start and finish of the race, and participants who have to go ashore during the race are likely to find sharp sticks, stones, or other debris. *Sharp edges and protruding bolts, nails, or screws. Any protruding or sharp edges should be cut off and/or bent/hammered/folded over and duct taped. Canoes and kayaks have no construction restrictions. Single-person kayaks must compete as pairs (2 boats per entry) to promote the "buddy system". The team’s place will be determined by the last boat to reach the finish line. Single entrants who need a partner can contact the race organizers and we will try to match up single entrants. Rafts should be removed from the river by sundown unless other arrangements have been made. Please check with management at The Waters before leaving a raft tied to their dock overnight. If a raft needs to be abandoned and can’t be removed from the river on race day, race officials need to be notified at the finish line. Rafts that take on water and have to be abandoned mid-race should be secured to shore and the position marked so it can be found and removed to avoid littering fines. Anything that is not addressed by the rules will be allowed, as long as it’s not judged to be a hazard to the crew or others at inspection.